Nearly every time you see him, he's laughing, or at least he's smiling. And he makes everyone else around him feel like smiling. He's the Dalai Lama, the spiritual and temporal leader of Tibet, the Nobel Prize winner, and increasingly popular speaker and statesman. Why is he so popular? Even after spending just a few minutes in his presence you can't help feeling just a little bit happier. The Dalai Lama is probably one of the only people in the world who if you ask him if he's happy, even though he's suffered the loss of his country, will give you an unconditional 'yes.' What's more, he'll tell you that happiness is the purpose of life, and that 'the very motion of our life is towards happiness.' How to get them has always been the question. He's tried to answer it before, but he's never had the help of a psychiatrist to get the message across in a context we can easily understand. Through meditations, stories and the meeting of Buddhism and psychology, the Dalai Lama shows us how to defeat day-to-day depression, anxiety, anger, jealousy, or just an ordinary bad mood. He discusses relationships, health, family, work, and spirituality to show us how to ride through life's obstacles on a deep and abiding source of inner peace. 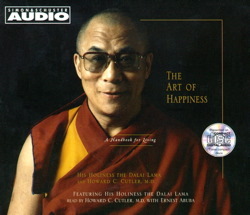 Based on 2500 years of Buddhist meditations mixed with a healthy dose of common sense, The Art of Happiness is an audiobook that crosses the boundaries of all traditions to help listeners with the difficulties common to all human beings. I liked the narrator's voice. Most of the messages were common place that we just do not make time to do or enjoy. I was expecting something a little more.......but maybe that is the point. It isn't that difficult and there is no magic to it. We just need to re-evaluate our perspectives and enjoy the good that is in everything. As I continue on my own Spiritual journey I have yet to find the perfect path laid out for me. As complex as I am, I have to find bits of enlightenment wherever I can. I found several enlightening things, including the mediations. The Dalai Lama claims that the purpose of life is to be happy. He is a Buddhist I am a Christian. I see a different purpose in life. A number of the ideas that he talks about are universal. Hate and anger tend to destroy the subject person, not the object of the anger. The presentation was well done with the voice moving back and forth between the Dalai Lama and reader. The book is a compellation of talks that the Dalai Lama had with Mr. Cutler, who should be listed as the author. Although the book is sold and marketed as written by the Dalai Lama this is not completely true. This book is a summary of talks with Mr.Cutler. I enjoyed this book. You can get as much as you want out of it. I believe that the more you listen to it, the better it becomes. For me, it definitely is a good start to the spiritual journey that lies before us. No offense to Dalai, this book is too preachy for me. I didn't find the elightenment that I hoped for. I was more drawn and learned more from "How To Practice The Way To A Meaningful Life". All of the Dalai Lama books are great. Wish the audio was a little better in some spots, but well worth the time. This was mildly interesting. The message and brief glimpse into Buddishm were thought provoking and at times inspiring. It did focus on the sufferring aspect, which is central to Buddist belifs, but it also brought in Western religion and even atheist aspects as well. The bad was the voice of Howard Cutler - monotone and not so inspiring and the honorable Dali Lama does not speak himself as a previous reviewer stated, his words are spoken by Ernest Abuba. It had some interesting ways of dealing with anger, death and jealousy...but at times it was irritating and I found myself fast forwarding too often. A wonderful introduction to Buddism, especially when the Dalai Lama is speaking.